It’s been a week for simple knitting here at the Waystation. I’m more than half way through a pair of simple short socks, which I cast on for Sunday. 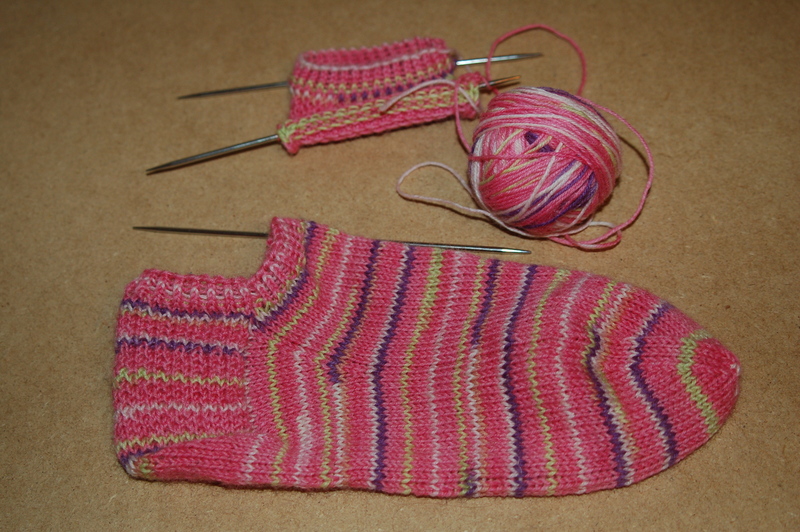 Pattern: Super Simple Short Sock by Meghan Holcomb, a pattern I used back in 2009. Mods: I didn’t like the heel, so I ripped it back — made the flap 2.25″ instead of 2.5″ and worked the heel cup from the Yarn Harlot’s Sock Recipe. I’m using yarn leftover from an earlier pair of socks. If/when I run out of this yarn, I’ve got a coordinating color ready to go. And then last night, despite the presence of said sock project, I cast on for a basic hat. Ah, the joys of photography black. Maybe I should not have even bothered. My husband (he recently informed me) is without winter head coverage, and this is not acceptable. 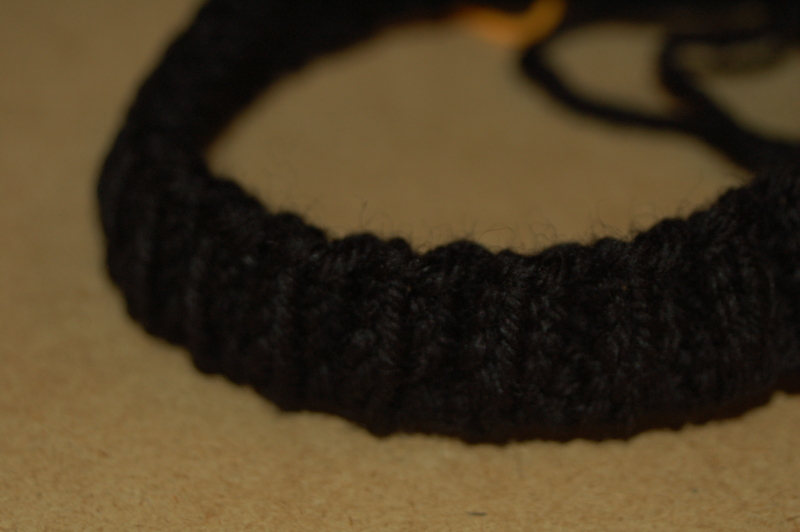 So even though it’s forecasted to be 84° F tomorrow, I’m working on a hat, in black Lion Wool. So far so good! Do you ever get the urge for simple knitting? P.S. : Last week I posted photos of my Springling Shawlette, and several commenters asked me to say something when that pattern became available. Well, Cosy’s Springling Shawl pattern was released this week. See the Fiber Arts Friday roundup at Wisdom Begins in Wonder to see what other people are crafting this week. This entry was posted in knitting and tagged fiber arts, fiber arts friday. Bookmark the permalink. What pretty colors for your socks. My knitting skills are extremely beginner level, but I often get the urge to crochet like that. I actually have a bin of leftover yarn…and when I have the urge, I’ll just crochet a granny square and throw it in the box. My plan is to eventually put the squares together into small afghans and donate them to the animal shelter. None of that looks simple to me. I love the socks and would wear them year round. Oh I really love those footies, I can see myself knitting a bunch of them! I always have a simple project for when I’m riding in cars or during times when I need to keep my hands occupied. But there are periods of time I gear towards simple knitting because of illness or stress. I had to knit some stocking hats for my husband too, at least this last time I talked him into letting me use winter white, so much easier on the knitter’s eyes. Yes, the black is quite difficult to see! But I gave him a choice, and this is what he picked. Thankfully, it’s a straightforward project, so that should help alleviate the potential eyestrain. Well, since I still consider myself a novice knitter, I always crave simple knitting projects! Of course, I’m getting better, so what I consider simple may not be someone else’s simple. Yeah, black certainly isn’t the only color that’s hard to photograph! Aw, I can see the stitches on the black hat just fine! And the yarn for the socks is great, I love the occasional purple stripe! Your socks are adorable. Love the colors. Yes, knitting a hat in hot weather just doesn’t seem right. I am knitting a simple cowl…all knit except for the ribbing at the top and bottom. Yes…easy knits are always needed. Well considering simple knitting is about all I can do..yes to answer your question! Good luck on your sock. It is a nice one!